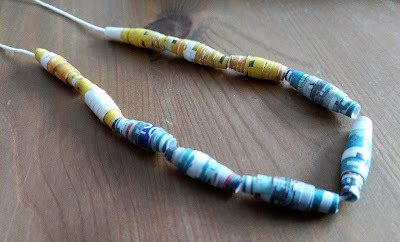 In an idle few minutes on Friday afternoon when I had given in and finally let Jessica watch some telly I decided to make a handful of paper beads from some old Good Food magazines that I had lying around. I was very haphazard about it and didn't bother marking out or measuring; I just wanted something to keep my hands and mind occupied for a while. They worked just about as well as when I have measured them carefully and it was quite liberating to be less precise about it to be honest. So I cut out some triangles from two adverts in the magazine and rolled them up around a wooden skewer (start from the base of the triangle) before brushing some acrylic varnish on them to secure. Once Jessica was able to tear herself away from CBeebies she was very keen to commandeer my beads and make herself a necklace. I usually use a cocktail stick to wind around but the wooden skewers made it much easier for Jess to thread the beads with her elastic and plastic needle. 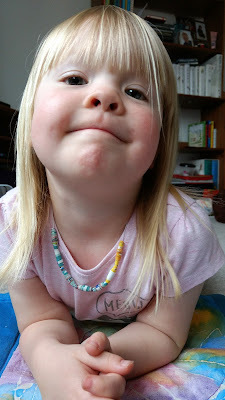 She definitely didn't order them as I would have done but it's her necklace so her choice. This is one of the things I find challenging, particularly when working with my own child. It's so tempting to meddle in the creative process of children but it teaches them nothing positive and potentially gives them lasting insecurities. As I have mentioned before, it's all about the process and not the end product. Besides, she thinks it's brilliant and I have to admit, it does look pretty good on her!